The fabulous Tammy Nelson sports the famous San Francisco Skyline Hat. Photo Credit: Beach Blanket Babylon. When I encounter visitors or newcomers to San Francisco, and they learn that I am “the Storming Bohemian, Your Cultural Concierge,” they invariably ask what must they do and know on their visit to San Francisco. My standard reply always includes the following, at a minimum: (1) Bicycle over the Golden Gate Bridge; (2) Know the story of The Emperor Norton; and (3) Attend Beach Blanket Babylon. Exactly. 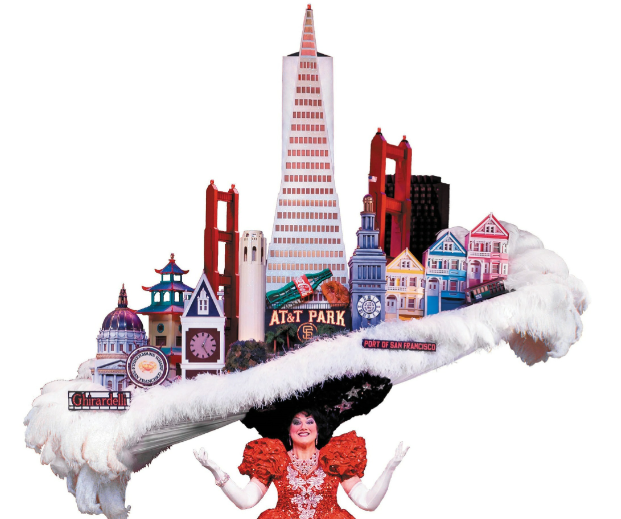 As the Moulin Rouge is to Paris, or the Rockettes are to the Big Apple, Beach Blanket Babylon is to San Francisco: a show that captures the essence of the city’s eccentric joy. Founded by a street entertainer (Steve Silver) who performed as a tap dancing tree (a tap dancing Christmas tree in season, of course), it has come, over its nearly 50-year-history to represent all the outrageousness, diversity, and celebratory tolerance that has made our city a beacon for dreamers of all stripes, ever since the days of the Gold Rush and even earlier. And it’s funny, and satirical, and musical and it has HATS. And tapdancing Christmas Trees. So, if you want to “get” San Francisco, get to Beach Blanket Babylon. And, if you haven’t already, google the Emperor Norton. For further information about Beach Blanket Babylon, click here.